Cirque Du Soleil “LUZIA” and Plaza Mexico partner for a launch event in preparation for "LUZIA’s" arrival to Los Angeles. A one-of-a-kind projection show will light up the Main Plaza Façade and take audiences on a surrealist journey inspired by the vibrant and breathtaking wonders of LUZIA. Don’t miss this mesmerizing FREE event on the first weekend of December exclusively at Plaza Mexico. WHEN: Dec. 2 and Dec. 3 from 2 p.m. - 8 p.m. / Light Show starts at 5:30 p.m.
Join the launch event with the whole family to enjoy fun activities, live mariachi, folklorico dancers, face-painting, giveaways and the chance to win tickets to the show. 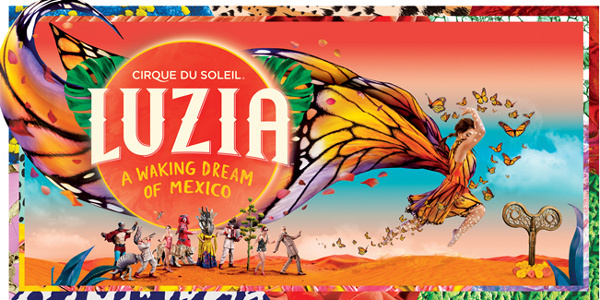 In a series of grand visual surprises and breathtaking acrobatic performances, LUZIA takes audiences on a surrealistic journey like in a waking dream, where light (“luz” in Spanish) quenches the spirit and rain (“lluvia”) soothes the soul. Smoothly passing from an old movie set to the ocean to a smoky dance hall or an arid desert, LUZIA cleverly brings to the stage multiple places, faces and sounds of Mexico taken from both tradition and modernity. Rich in awe-inspiring moments, LUZIA enchants by incorporating rain into acrobatic and artistic scenes – a first for a Cirque du Soleil touring production.